I am a professor at California State University, Los Angeles teaching Fundamentals of Writing for Biologists. I am an advocate for students learning science through active learning. In the Spring of 2014, I partnered with the Urban Resiliency Program to bring citizen science into my classroom. My objectives were simple; get students outdoors and active in the community through research and generate a dataset for their research paper. With the help of the Urban Resiliency team, I incorporated several programs into my course. My students are urban city dwellers that work part-time and commute to school. This weekly workload plus the horrible Los Angeles traffic leaves them very little time to pursue activities outside of school, let alone explore the outdoors. I come from a similar background, and I can recall a strong disconnect from nature, even with all the biodiversity that exists in urban areas. Connecting with nature can have a profound impact ranging from mental, physiological, and therapeutic benefits. I knew this partnership with the Urban Resiliency Program could be very beneficial for both parties. However, I faced a challenge in convincing my students, who range from microbiologists to pre-medical students, that this project was worthwhile. I placed the project in a context that appealed to their fields of interest by discussing topics such as the changes in microbe communities to the human health benefits of trees in urban areas. For the first year, the hypotheses tested centered around the goal of the study, which involved comparing a measured variable, such as tree diameter, to drought. James Pineda comments “The outdoors broadened our horizons about the biological field, giving us a different angle compared to just the conventional laboratory specimens and compounds.” This easily implemented non-traditional classroom approach impacted my students in a way I was not expecting, shaping the dynamic, attitude, and interests of the entire class. The following year students were given the freedom to address their hypothesis given the variables collected, and the research papers became very interesting. 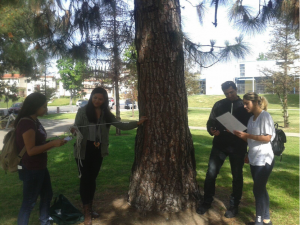 For example, one student focused their research paper on social justice issues by conducting green space analysis across Los Angeles County Parks in relation to race, education, and income. The main findings of the paper suggest that most parks are composed of concrete rather than green space and, despite most studies correlating smaller sized parks to race and income, this particular report was not in agreement. Another student explored the potential of using these variables to predict the effects of mitigating urban heat island effects across Southern California. They found that although the measured variables are important at a smaller scale, park size and structure played a stronger role in parks promoting cooling effects. 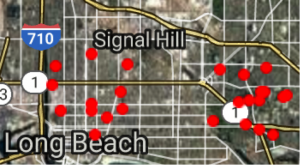 This past summer, with the switch to Operation Healthy Air, students were asked to participate in Habitat mapping of locations where sensors had been placed to measure temperature, humidity, and ozone. 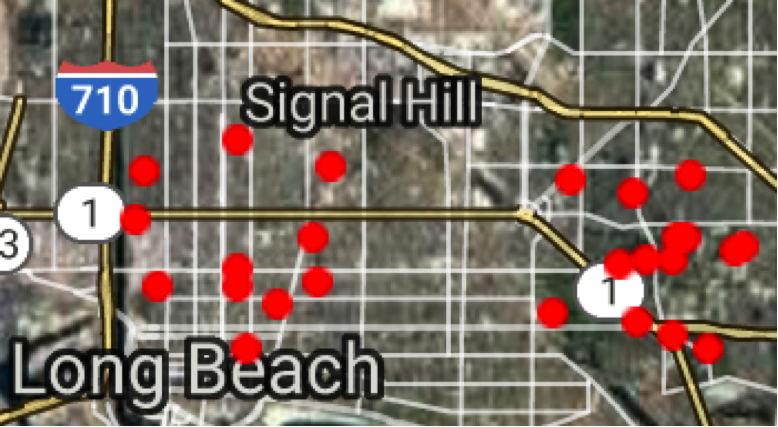 They mapped a total of 33 locations spanning the Long Beach Area. 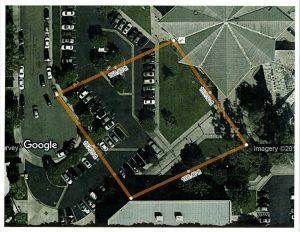 The students also set up four sensors on campus, two in parking lots and two in lawns that were 200 feet apart. The students were not asked to write a report on this activity, but we did have a discussion session on the importance of air quality. I was surprised to learn how much my students did not know about the health effects of poor air quality. However, I was pleasantly surprised to learn about the issue of poor air quality and the joint efforts of San Pedro and Long Beach through the Clean Air Action Plan to reduce air pollution produced from the ships, trains, trucks, terminal equipment and harbor craft that operate in and around the ports. I was also fortunate to contribute habitat mapping of eight locations through the California Naturalist Program this past fall, which aims to foster a diverse community of naturalists and promote stewardship of California’s natural resources through education and service. Some recommended improvements to the Habitat Mapping software are correction for glitches, such as not being able to access locations that are too close to one another, freezing of the screen with complete elimination of the work already inputted, and making the activity more fun by adding a reward for productivity. The class experienced a lot of technical difficulties, and frustrations in completing projects of various sites. Students enjoyed getting the experience of being true scientists, carrying out a study from beginning to end for the Urban Resiliency Program. They independently developed a hypothesis, collected and analyzed data, and produced a final written product. For most students, this was their first experience outside of the classroom, directly applying what they had recently learned to an ongoing project with real-world implications. They started to view urban space differently, taking into account natural areas. Working outdoors as a group also made students form stronger bonds and give them a sense of community that transitioned into the classroom and into long-lasting friendships. For the Operation Healthy Air project, student Madeline Currey states, “I was surprised at how many different ways green-spaces/plants can be categorized! 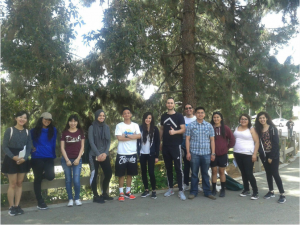 Habitat Mapping taught me the importance of low-impact land use on wildlife conservation in urban areas.” The overall response by the class on the topic of air pollution was positive and the class wanted to contribute to collecting and analyzing of data. I enjoy being a teacher because of the benefit of continually improving and growing through working with students. Collaborating with the Urban Resiliency Program for this project was my first exposure to “citizen science.” This experience taught me how combined efforts at a local scale can create a real impact in advancing research and solutions to current problems. This experience also generated an unforeseen outcome of an article published in the Applied Biodiversity Science Perspective Series (http://hdl.handle.net/1969.1/166246). This article discusses the use of citizen science to engage underrepresented communities, particularly co-creative equal partnership in an effort to address community-specific environmental issues.Additionally, this article also explored training programs as a mechanism to provide environmental job skills and empowerment through policy training for disenfranchised communities to advocate for environmental justice. My class will team up with the Urban Resiliency Program again this summer to continue on the Operation Healthy Air project, but in the meantime we have partnered with the Audubon’s center at Deb’s Park to carry out a study on natural alternative methods for pest control management of gopher populations. I highly encourage educators at all levels to immerse their students, and even themselves, in citizen science projects such as the Urban Resiliency Program. I found a lot of support by staff in materials for the classroom, such as PowerPoint’s and video trainings, as well as materials for the field. My students were surprised at how fun learning, carrying out, and contributing to science could be. These type of collaborations are also an excellent mechanism to promote diversity in science, key to innovations and advancements in the field. Getting students interested and keeping them interested in what science is and the process of science can be a real challenge. Citizen science projects, where students collect or process real data offer a great way to do that. Professor Karen McReynolds of Hope International University works with lower division, non-science-major college students built a curriculum to enable her students to produce meaningful, useful data supporting Operation Healthy Air (OHA) as a class project. As a result, some of the best maps for OHA were produced and students participated in a real-world science experience relevant to the communities where they live. Until recently, students in Prof. McReynolds class would complete a research project and make a poster for their Earth Science project, but the project results would remain remote from the real world (at least in their eyes); “it’s just another academic exercise.” Working with OHA and interpreting neighborhood green, blue, and gray space from above via the Habitat Network tool offered them a much more tangible connection to real life. 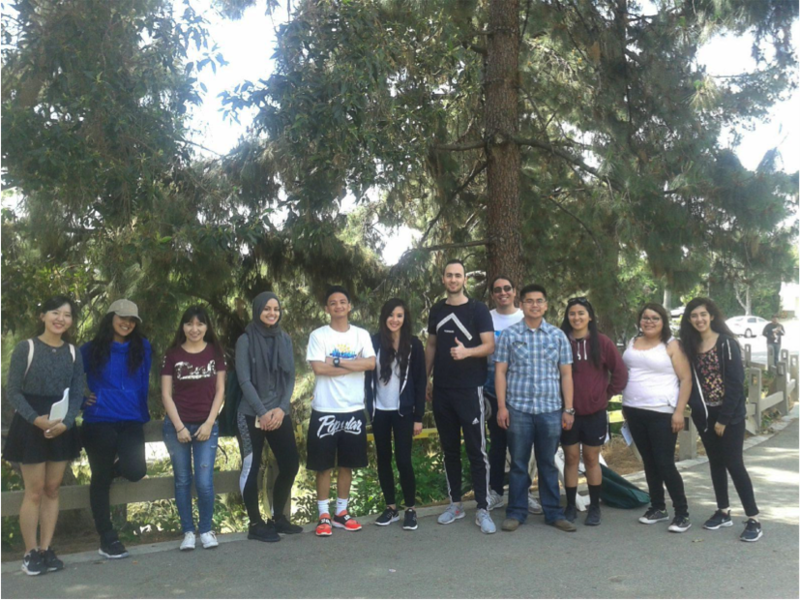 Creating a project for students to participate in OHA gave a way to very concretely anchor their Earth Science coursework to their experience as residents of the Los Angeles area. Prof. McReynolds first initiation to Earthwatch’s citizen science programs was having students in her biology courses collect data on trees for Operation Resilient Trees. Having seen successful adoption and interest by her students in citizen science, Prof. McReynolds was ready to try OHA, which offered a good fit for Earth Science students with its focus on discovering how differences in the environment affect local air quality and temperature. The introduction set the stage for the students and was the research component of the class project. Students were asked: “What is the value of Operation Healthy Air? You are not completing an academic exercise with this project – you are joining a regional effort to evaluate the effects of green space on temperature and air quality, which will be of increasing importance with every passing year. Why is this important?” Further instructions included length, formatting and resource guidelines, including a requirement for students to use three or more of the sources provided by Director of Research Initiatives, Dr. Mark Chandler, in addition to at least one other peer-reviewed source they found on their own. The heart of the project was the creation of five maps. Given that a universal concern within the citizen science world seems to be “but is the quality of the work good enough?” Prof. McReynolds developed a progressive series of practice maps intended to prepare them to do their highest quality work on the “real” maps surrounding the OHA sensors. The first practice map was done by hand not electronically for several reasons. Many students were unfamiliar with basic spatial mapping skills, familiarity with different habitat types (e.g. 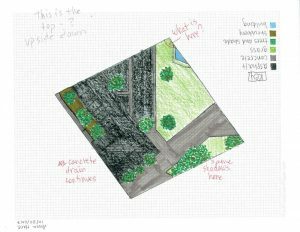 types of vegetation, asphalt vs concrete pavement, etc. ), sense of scale and a hand drawn map created a powerful way to build these skills before starting the online mapping. Furthermore, the Habitat Network mapping tool (www.yardmap.org) does not permit the same area to be mapped repeatedly by different people. The first map was the only map that all the students did of the same location, which permitted the instructor to compare, check for uniform quality, and catch common errors. 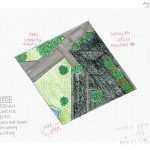 For practice map 1, each student was given graph paper and the same color photo taken from Google Maps via the Habitat Network to use as a base for their hand-drawn paper map. The area selected was a location on campus that included a combination of trees, buildings, parking lot, street, and landscaping that was similar to what students would be mapping on their OHA maps. It was also the same size (about 27,000 square feet) as the areas they would be mapping for OHA. 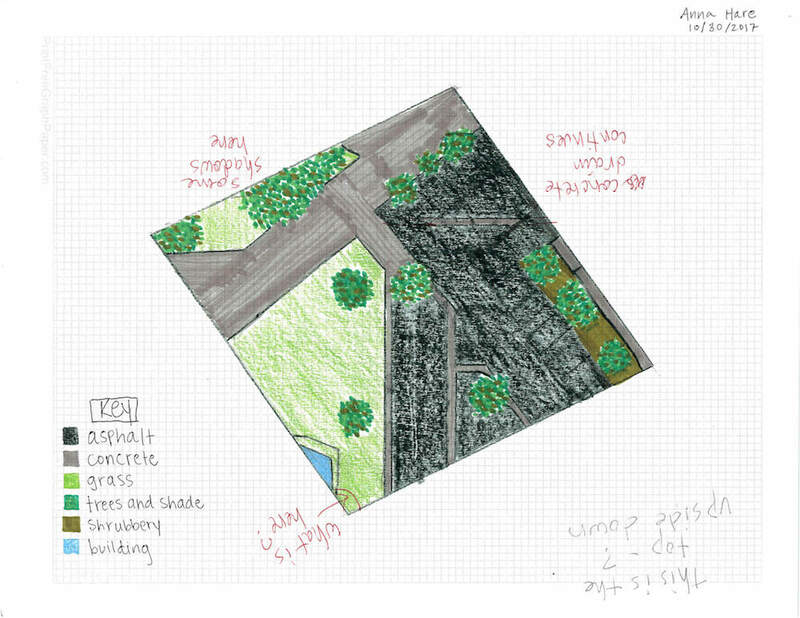 The assignment was to make a hand-drawn map on the graph paper of the campus location. Four corners of a square were established and the class walked the perimeter as a group to make sure the boundary was clear. After each student completed the paper map of an area on campus that was easy to “ground truth” to confirm, Practice Map 2 was assigned. By now, students needed to begin getting acquainted with the Habitat Network mapping tool OHA uses to construct its maps. The instructor set up accounts in Habitat Network and assigned one to each student. This gave the instructor access to their accounts for evaluating their maps. This time the student could choose an area they wanted to map. It had to be the same size as their OHA maps would be, and it had to be in a public place such as a park where they could go and ground truth their map after completion. Once they decided where they wanted their map to be, they were instructed to use OHA’s Cheatsheet to help them make their map of the area. When complete, they needed to take a screenshot photo of their Habitat Network map and print it out in color as an 8 x 10-inch photo, then visit the site with the photo and check their map for accuracy. They also had to answer a series of questions while they were at the site and submit answers to questions along with their map photo and notes taken at the site. Maps were graded by the instructor using the mapping rubric created by OHA, with a portion of the grade coming from answers to the questions they submitted. After completing the two practice maps, students were ready to move on to the actual citizen science work—mapping sites surrounding OHA temperature and ozone sensors. Each student was assigned coordinates (supplied by OHA) for three different locations. When their three maps were complete, the final part of the project involved writing a conclusion. This required analysis of the specific activities they completed and a review of the OHA project as a whole. Feedback from students was overall very positive and included appreciating the value of the introduction at the start of the project about the real science and applied nature of the project, and, the general usefulness of completing practice maps before embarking on the maps that were linked to sensor locations. Even within the three maps that were linked to sensors (the “real” maps), the students noticed improvement with each map completed. There were also favorable comments on the OHA support available, reflected both by Dr. Chandler’s visit to the classroom and the reference sheets and resources that were present for student use. The most consistent negative comments received from students in their conclusions were that the first practice map did not seem relevant to the project as a whole. They did not see the value in completing a hand-drawn map when the requirements from OHA were all electronic maps completed through yardmap.org. It appears that the students benefitted a lot for the hand drawn maps yet did not appreciate why or how they improved their online mapping skills as a result. Students also drafted a list of comments from students on to help improve Habitat Network: students perceived the website to be slow and awkward to work with, and some of the images had poor quality. Although they required significantly more work from the students, creating the practice maps seemed very valuable to Prof. McReynolds. Most importantly, Dr. Chandler of OHA reported that the student’s maps were the most accurate and detailed of the various maps OHA received from volunteers. The hand-drawn practice map 1 showed them clearly just how large the area each map covered was and let them begin to get a sense of what a tree looked like from above compared to what it looked like standing next to it. The second practice map got them working with the Habitat Network and allowed them to work through errors or oddities before they began analyzing actual OHA sensor locations. It also gave them further experience in comparing trees from above with what is actually present at the location. Prof. McReynolds think keeping the hand-drawn map is valuable. Physically walking the perimeter of a square is a helpful learning experience, helping to understand how big that square is and seeing the difference between asphalt and concrete. Because the final maps turned out so well, it seems there may be some hidden success in drawing the original map. However, a change to make for next time would be to spell out more clearly to the students what the purpose of the first practice map is at the beginning. The new Environmental Science course at Hope that begins in spring semester 2018 will be taking this project even further, with placement of sensors at various locations around Fullerton and then mapping the locations linked to those particular sensors. They are looking forward to contributing further to the data that OHA is collecting and the larger picture of determining how the Los Angeles area will fare as temperatures continue to rise. One improvement in spring of 2018 will be to explore more about the air temperature and quality data collected at the sites they mapped. The addition of that component, which would permit correlation of temperatures and tree cover, could ratchet student interest up another notch. With non-majors, this is always a good thing. We are looking forward to exploring more about how to use authentic science in the classroom to create more science literature students. Please send us any thoughts or feedback on this blog!